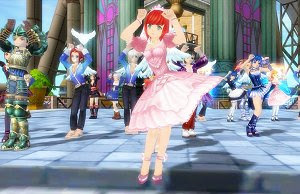 Lucent Heart is a hit free-to-play game from Japan that includes a Zodiac system, a full-featured Dance System and a deep level of social interaction as some of the highlights. With the Zodiac system, players get to benefit from special powers and a Zodiac form, thanks to the character’s star sign and birthday, chosen at the beginning. The Dance System lets players create their own choreographies in the Dance Creator tools and even compete in dance events to win some special prizes. The Cupid will present you to your soulmate and both may earn special benefits by playing together, even to the possibility of marrying in a beautiful church ceremony.